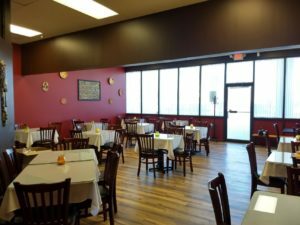 I want to tell you the story of an impressive entrepreneur who owns a heck of a little restaurant named Zagol, which just moved to a convenient new location on Mira Loma and South McCarran in Reno. This story is not about how great the food is at Zagol (which it is), but actually about the entrepreneurial spirit from a woman who is an immigrant to our country and how she has embodied the American dream. Shita is a powerhouse-of-a-woman. If you were to stretch her out, she wouldn’t be more than five feet tall, but she comes packaged with the entrepreneurial smarts and tenacity it takes to be successful. Born in Ethiopia, she immigrated to the United States in 1983 and started working in the healthcare industry as a housekeeper, but she dreamt of owning a restaurant. Her dream finally came true when she opened Zagol. The restaurant’s first location was on 4th Street. Getting the restaurant open was just the start of years of hard work she has endured to make it successful. For years, Shita managed the restaurant, doing all of the cooking, serving, cleaning, restocking, and paying the bills. And for years, Shita worked double and triple shifts. 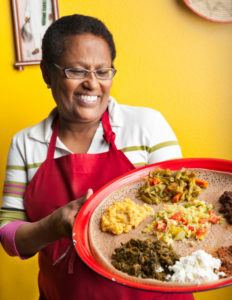 She would start early in the morning between 3 to 5 a.m. and make the Injera for that day for the restaurant. Injera is the bread of Ethiopia and it is served warm with your meal. It essentially acts as your utensils. It’s like a crepe with more holes. She would have a little bit of time to rest or sleep before Zagol opened for lunch. She would work through the day and for most nights of the week, when she was done with the dinner crowd at Zagol, Shita would head off to Renown Hospital to work a shift there during the night — only to get back up early to make Injera again the next day. Shita was doing all of this as a one-woman show! I know for many people Ethiopian food sounds exotic so, I “dare” you to eat Ethiopian food. I use the word “dare” in a fun, facetious way, because a lot of people imagine Ethiopian food to be exotic and strange, but that couldn’t be further from the truth. My palate is very limited, and I don’t eat exotic foods, and I find Zagol’s menu very approachable and pleasing and not the least bit strange. I kid you not — every time I eat there, my first bite always blows me away with a big explosion of flavor and it puts a big smile on my face. 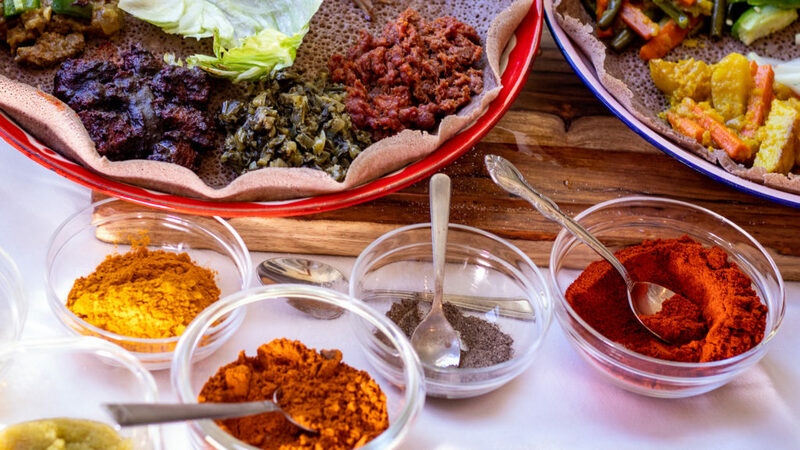 Shita’s food is made with traditional Ethiopian recipes, including an abundance of spices. My “dare” is not really a dare at all, but it’s an invitation to support a great Reno entrepreneur and enjoy yourself at the same time! Ethiopian-style dining means leaving all utensils behind and using your hands to eat. There is not a fork, spoon, or knife to be found. It’s a little strange at first — you feel like Ma’s going to tell you to stop playing with your food — but it’s fun and you soon get used to it. The food is brought out family-style with all of your table’s individual dishes served together on the same very large, round plate. Next to your large plate is a basket of the warm pieces of Injera, made with Shita’s love. Shita has been working at this pace for years now and is looking for someone to help her run the restaurant. She aspires for one day off a week! If you know someone who has restaurant chops (hosting, serving, bussing, and more) and would be excited to learn how to cook traditional Ethiopian food, give Shita’s daughter, Malet, a call: (201) 694-8785. Zagol moved from its 4th Street location to Mira Loma and McCarran, and the interior looks as nice as ever. P.S. Shita encourages new and frequent customers to attend her “coffee ceremony.” This is a reservation-only event and would be great for treating your out-of-town guests or family! She roasts the coffee beans herself, and presents the coffee while bedecked in traditional Ethiopian garb.